Only two species of Metopolophium occur in the Pacific Northwest, Metopolophium dirhodum (rose grass aphid) and Metopholophium festucae sensu stricto. M.f. cerealium can be distinguished readily from M. dirhodum because M.f. cerealium has a pattern of broken bars on its abdomen and M. dirhodum does not. M. festucae s.s. are very similar in appearance to M.f. cerealium and require more sophisticated identification methods to tell the difference between the two, but M. festucae s.s. is rarely found on cereal crops. 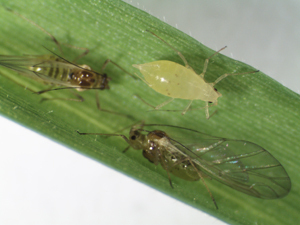 It is not yet known if this new aphid will be a significant pest of cereal crops in North America, but M. festucae is a known vector for the Barley yellow dwarf virus. Entomologists at UI, as part of the REACCH project, are continuing to monitor M.f. cerealium populations. For the full article click here.